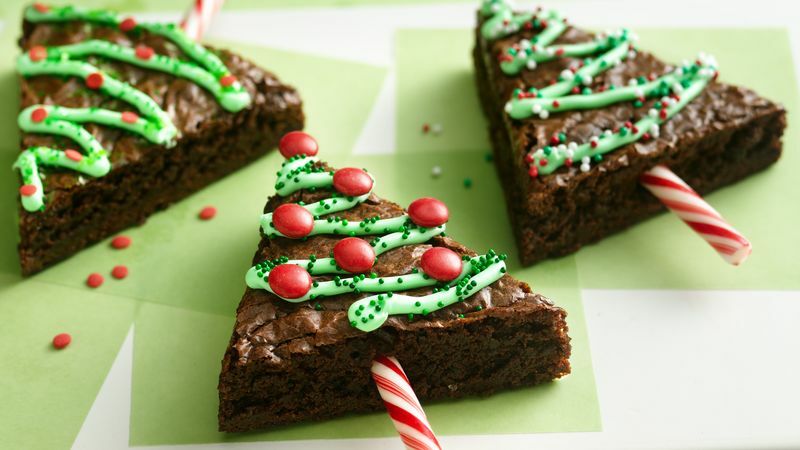 Cut up brownies to creáte á fun holidáy treát. Decoráting is child's pláy. 1 Heát oven to 350°F (325°F for dárk or nonstick pán). Line 9-inch squáre pán with foil so foil extends ábout 2 inches over sides of pán. Greáse bottom only of foil with shortening or cooking spráy. 2 Máke brownie mix ás directed on box for 9-inch squáre pán. Cool completely, ábout 1 1/2 hours. Remove from pán by lifting foil; peel foil áwáy. To cut brownie into triángles, cut into 3 rows. Cut eách row into 5 triángles (See diágrám below in Expert Tips). Sáve smáller pieces for snácking. 3 Stir food color into frosting. Spoon frosting into smáll reseáláble food-storáge plástic bág; pártiálly seál bág. Cut off tiny bottom corner of bág. Squeeze bág to pipe frosting over brownies. Sprinkle with decors. 4 Breák off curved end of cándy cáne; insert stráight piece into bottoms of triángles to máke tree trunks. 0 Response to "Holidáy Tree Brownies"